Previous research has provided theoretical frameworks for building inter-disciplinary bridges between sociology and the neurosciences; yet, more anatomically, or functionally focused perspectives offering detailed information to sociologists are largely missing from the literature. This manuscript addresses this gap by offering a comprehensive review of the functions of the frontal lobes, arguably the most important brain region involved in various “human” skills ranging from abstract thinking to language. 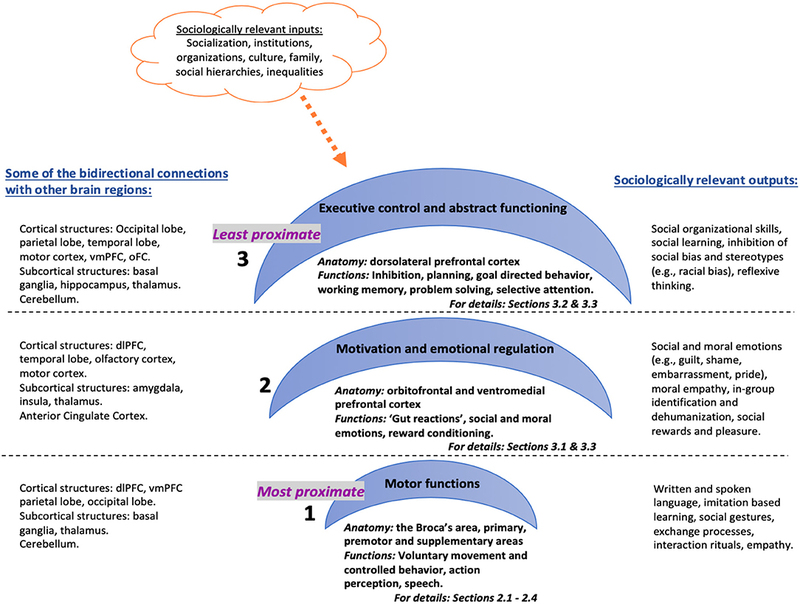 The paper proposes that the functions of the frontal lobe sub-regions can be divided into three inter-related hierarchical systems with varying degrees of causal proximity in regulating human behavior and social connectedness: (a) the most proximate, voluntary, controlled behavior—including motor functions underlying action-perception and mirror neurons, (b) more abstract motivation and emotional regulation—such as Theory of Mind and empathy, and (c) the higher-order executive functioning—e.g., inhibition of racial bias. The paper offers insights from the social neuroscience literature on phenomena that lie at the core of social theory and research including moral cognition and behavior, and empathy and inter-group attitudes and provides future research questions for interdisciplinary research. The notion that the mind, self, and society are fundamentally intertwined (Mead, 1934) is not new to sociology. Since the first acquaintance with the term “neurosociology” (TenHouten, 1973), biology, and neurosciences have slowly been finding their ways into sociology (e.g., Franks, 2010; Turner and Maryanski, 2012; Franks and Turner, 2013; Kalkhoff et al., 2016a; Melamed et al., 2017); albeit, facing much resistance, and opposition from the discipline (Hopcroft, 2016). On the one hand, this resistance is partly due to the biophobia fueled by the racist and sexist legacy of the Social Darwinist accounts of human biological functioning; on the other, it is in large part due to a lack of knowledge and information available to sociologists on how the human brain and biology operate. This lack of information, in conjunction with the growing importance of the field of neurosciences and especially the sub-field of social neurosciences, has led to concerns about neurosciences' oversight of the so-called “thicker,” sociological concepts and the philosophical roots of the concepts of study and their operationalizations (Abend, 2011, 2017) as well as the assumed causalities in the neuro-fields (from brain to behavior) and biomedicalization of culture and social domains like mental health, education, gender (Martin, 2004; Pickersgill, 2013). While previous literature has offered theoretical guidelines on bridging this gap between sociology and the neurosciences (e.g., Firat and McPherson, 2010; Firat and Hitlin, 2012; Kalkhoff et al., 2016b), more anatomically or functionally focused perspectives opening the so-called “black box” to the sociologists is largely missing from the literature. This paper attempts to bridge this gap by offering a comprehensive review of the functions of the frontal lobes, arguably the most important brain region involved in various “human” skills ranging from abstract thinking to language, and their implications for causality and epistemological mechanisms in social theory (see for example, Abend et al., 2013; Vaidyanathan et al., 2016 for sociological discussions of causality). The frontal lobes, the largest brain region constituting almost one third of the entire human brain (Blumenfeld, 2002), extend from the central sulcus and lateral fissure to the frontal pole (Waxman, 2010). Potentially through a recursive cortical evolution between brain, environment, and behavior, the evolutionary development of the frontal lobes played a key role in primates and especially humans above other mammalians to develop many cognitive skills, including working memory and language. The frontal lobes of the primates, especially humans (particularly the prefrontal cortex) develop later in an individual's life and are disproportionately bigger than the frontal cortices of other species (Fuster, 2002). The frontal lobes are also extensively connected with other cortical and subcortical regions (Fuster, 2002). Consistent with its larger size and numerous connections with other brain regions, this brain area is responsible for a diverse and often contradictory set of functions that make it one of the most complex brain regions to study (Blumenfeld, 2002). The complexity of the frontal lobe functioning is also evident from the patients with damage to this area (i.e., vmPFC) who may perform within the normal range in standardized tests of intellectual ability and language, while having major problems in emotional regulation, moral functioning or complex, real life social behavior (Anderson et al., 1991, 2006). The frontal lobe functions include (but are not limited to) abstract reasoning, creativity, and socially appropriate behavior, which are critical for humans to engage in ongoing social interactions as well as sophisticated decisions (Stuss and Benson, 1984; Blumenfeld, 2002; Waxman, 2010). I propose that the anatomical architecture of the frontal lobes can be divided into three inter-related hierarchical systems with varying degrees of causal proximity in regulating human behavior and thought (see Figure 1). I argue that this anatomical structure implicates a functional hierarchy that has clear consequences for social behavior, particularly for social connectedness by regulating: (a) action-perception model of mimicry and basic empathy (aka mirror neurons), (b) emotional and cognitive empathy (aka Theory of Mind) and (c) self-reflexivity and overwriting automatic responses (e.g., inhibiting certain social responses or changing decisions based on reflexive evaluations). The first system consists of the most proximate operator areas, which are responsible for voluntary, controlled behavior that include motor functions such as speaking and muscle movements. Anatomical correlates are the Broca's area in the dominant sphere as well as the motor regions including primary motor, premotor and supplementary motor areas. One of the most remarkable (albeit controversial) discoveries within this region is the particular neurons firing when acting or observing the same act in another, thus speculatively facilitating action-perception or mimicry as precursors to empathy (Gallese, 2001; Iacoboni et al., 2005; Kilner et al., 2009). The second system involves the somewhat abstract, intermediary motivator regions involved in “gut reactions” and emotional regulation. Functions of this system would be reward processing, social or moral emotional regulation and empathy (Greene et al., 2001; Moll et al., 2001); anatomical correlates are the bottom half of the prefrontal cortex—i.e., the ventromedial prefrontal cortex. The third system is the least proximate, higher-order executive control center that reconciles person's behavior with the environment at an abstract level to connect past, present and future experiences (MacDonald et al., 2000; Alvarez and Emory, 2006). Functions of this system include as attention, working memory, planning, decision making, and the anatomical correlates are the top half of the prefrontal cortex, i.e., dorsolateral prefrontal cortex. Figure 1. Three inter-related hierarchical systems with varying degrees of causal proximity in regulating human behavior and thought. This anatomical and functional organization implies that the frontal lobes operate at three inter-dependent causal levels that range from immediate action, to conscious or non-conscious feelings, to mostly conscious higher-order evaluative but also inhibitory thoughts. Lieberman (2007) also suggests a similar division of labor between the ventromedial and lateral prefrontal cortices (among other brain regions), the former corresponding to an automatic social cognition system and the latter involved in a controlled social cognition system. The argument here is not that the brain causes social behavior or thoughts (i.e., ultimate causes), but rather that the brain is a proximate causal mechanism (the “how”) that catalyzes internal and external stimuli into individual action or thought (see Scott-Phillips et al., 2011 for the distinctions between proximate and distal causes in evolutionary theory). So, the paper does not seek to ascribe any agency to the brain, but rather proposes that it is potentially one of many proximate causal mechanisms—immediate, sufficient causes. For example, damage to the occipital lobes (the visual cortex at the back portion of the brain) would impair vision (a proximate cause), but damage to eyes would also impair vision (another proximate cause). But either one of these damages might have occurred due to a car accident the person has experienced (distal or ultimate cause). Furthermore, human behavior and cognition result from neural network activity rather than isolated regional activations (Baronchelli et al., 2013). Frontal lobes are not the only brain areas related to some of the processes or functions discussed here (for example, temporoparietal junction, superior parietal lobe, and the pulvinar among others are all part of the attention networks of the brain, Raz, 2004). Yet, an understanding of how distributed networks operate require a foundational knowledge on the individual functions of anatomical regions. Therefore, in this paper, I offer a review of the functional organization of the frontal lobes as they are vital to higher cognitive and emotional operations that are required for complex human social organization. In the next sections, I demonstrate this organizational hierarchy by first explaining the contribution of the frontal lobes to voluntary, controlled behavior (motor functioning) and the mirror neuron system, and then elaborating on how the prefrontal cortex is involved in more abstract aspects of individual functioning including motivation and emotional regulation, and executive functioning, respectively. Lastly, I illustrate the implications of this organization for social theory by focusing on the research on: (a) moral cognition and behavior and (b) empathy and inter-group attitudes. Among the important functions of the frontal lobes are voluntary movement and control of behavior (Colby and Olson, 2003). Below, I detail the role of the frontal lobes in motor behavior with reference to four key regions with distinct yet interrelated functions (frontal lobes and the location of some of the main frontal lobe areas are shown on Figure 2). While the role of premotor cortex in the mirror neuron network seems to be the most sociologically relevant function on the surface, together these regions enable humans to perform complex motor tasks including speaking and thus it is crucial to have a basic understanding of all of them. Figure 2. Neuroanatomy of the frontal lobes. (A) presents left view and (B) presents right view. Adapted from the Harvard-Oxford atlas developed at the Center for Morphometric Analysis (CMA), and distributed with the FMRIB Software Library (FSL) (Bakker et al., 2015), 3D Surface View (Majka et al., 2012). The primary motor cortex, which is located on the precentral gyrus, contains a somatotopically organized (point by point correspondence of body parts to the motor areas) map of the muscles of the body that represents the leg medially, situated in the middle, the head laterally, toward the sides, and other body parts at intermediate locations (Colby and Olson, 2003). Neurons in the primary motor cortex receive proprioceptive input from and innervate these muscle groups (Colby and Olson, 2003). The primary motor cortex is the largest contributor to the corticospinal tract carrying action potentials to the spinal cord indicating its significance in muscle movements (Porter and Lemon, 1993; Dum and Strick, 2002). Studies with monkeys reveal that neurons in this area are involved in both selection of the direction of movement and the patterns of muscle activation (Kakei et al., 1999). Various other studies also observe that the primary motor cortex is activated before and during movements, during learned arrest (inhibition or restrain) occurring before movements, or in envisioning movements (Georgopoulos et al., 1982, 1984; Smyrnis et al., 1992; Decety et al., 1994; Rao et al., 1996). Another important feature of this region is the plasticity of the synapses that allow distinguished flexibility in motor behavior in animals with larger forebrains (Sanes and Donoghue, 2000). The premotor area lies in front of the primary motor cortex on the lateral surface (Weinrich and Wise, 1982; Wise, 1985; Blumenfeld, 2002). The premotor cortex receives visual and somatosensory information (Fogassi et al., 1996; Graziano et al., 1997) and is involved in visually guided movements and limb positioning in space (Godschalk et al., 1981; Kurata, 1993; Kakei et al., 2001) as well as limb ownership (self-attribution of body parts; Ehrsson et al., 2004). In addition to areas involved in limb movements, the premotor cortex also includes the frontal eye fields, a region that shows increased neuronal activity during the execution of eye movements (Paus, 1996). The frontal eye field, which is extensively connected to extrastriate visual cortex (Schall, 2002), controls saccadic eye movements by shifting eye gaze (Bruce et al., 1985; Schall, 2002) as well as attention (Schall, 2002). Broca's area, which is located in the inferior frontal gyrus of the dominant sphere (see Figure 2), controls the ability to coordinate the muscles necessary for speaking (Amunts et al., 1999; Waxman, 2010). Named after famous French anatomist Paul Broca due to his studies associating lesions in this area with speech impediments (Keller et al., 2009), Broca's area coordinates vocalizations (Afifi and Bergman, 2005) and is also considered to be specialized in identifying natural principles of language (Musso et al., 2003). Lesions in this area lead to Broca's aphasia, which is characterized as difficulty in motor production of speech (including poor repetition, problems with naming, reading, and writing) while comprehension is intact (Stuss and Benson, 1984). In addition to speaking, it is also demonstrated that Broca's area and its right homolog is involved in musical syntax processing (Maess et al., 2001). First discovered in monkeys, the so-called mirror neurons in the premotor cortex (F5 area) were neurons firing both when the monkey performed and act and observed another doing a similar act (for example picking up food; Di Pellegrino et al., 1992; Gallese et al., 1996; Rizzolatti et al., 1996). Later studies have confirmed similar activation in the Broca's region in humans when people observed or executed a similar action (Heiser et al., 2003; Rizzolatti and Craighero, 2004; Kilner et al., 2009) though human studies of mirror neurons are much more scant leading to skepticism among some. While initially considered as an action recognition mechanism, later studies have expanded the role of mirror neurons to intention recognition (Iacoboni et al., 2005; Kaplan and Iacoboni, 2006). In this view, the mirror neuron network is involved in detecting the intentions of actors while watching their actions, a building block for empathy (Gallese and Goldman, 1998; Preston and De Waal, 2002; Decety and Jackson, 2004). An important implication of the mirror neuron hypothesis is that the evolved capacities for empathy involve a much more basic and automatic system that has evolved “bottom-up” from simple motor functions for action and perception (Iacoboni, 2009). Furthermore, evidence that mirror neurons also respond to sounds (Kohler et al., 2002; Gazzola et al., 2006) and that the mirror neurons in monkeys are homolog of the Broca's area, responsible for speech production in humans (Petrides et al., 2005), gave way to the hypothesis that mirror neurons might have harbored the evolution of language in humans, bridging “doing” with “communicating” (Rizzolatti and Arbib, 1998). The supplementary motor area, which lies in front of the primary motor cortex on the medial surface (Tanji, 1994; Blumenfeld, 2002), is involved in the motor sequencing of limb movements (Roland et al., 1980; Mushiake et al., 1991) and saccades (Gaymard et al., 1990, 1993; Colby and Olson, 2003). Studies show that the supplementary motor area allows complex sequential motor function by the planning and coding of sequences of movements before the movements are executed (Roland et al., 1980; Tanji and Shima, 1994). At the first level of proximal operation, I propose that the motor activation in the frontal lobes correspond to the most basic capacities for intention reading (or reading other minds) through action perception via the activation of the mirror neuron systems. These motor operations underlie several symbolic interactional processes such as written or spoken language, acts and gestures (Mead, 1934); and thus, serve as the most proximal causal precursor to extending minds beyond the individual, propagating social connectedness. Symbolic social interaction is an interactive process of communication via gesturing (through spoken, written or body language) in which both parties adjust to each other (Mead, 1934; Goffman, 1959). This interaction or exchange process, which can be characterized by voluntary muscle and eye movements as well as motor production of speech all depend, I argue, on the voluntary motor behavior regions of the frontal lobes (e.g., the primary and supplementary motor areas). However, human beings act toward things on the basis of the meanings they assign to them, and these meanings are constructed as well as modified and reconstructed through social interaction (Blumer, 1969). Dovetailing to Durkheim (1912/1995) and the concept of “collective effervescence”—shared, collective communication or feeling through participating in the same action, neo-Meadian sociological theories of symbolic social interaction, specifically Interaction Rituals theory would particularly benefit from an understanding of the action perception in the motor cortex. According to Interaction Rituals theory, actors engaged in the shared ritual or act generate a collective emotional energy that promotes feelings of solidarity (Collins, 1981, 1987, 1993, 2014; Collins and Hanneman, 1998). Actors in social interaction view this emotional energy and solidarity as an ultimate good and seek further interactions to maximize their collective emotions, hence creating interaction rituals (Collins, 1993). The ways interaction rituals mobilize people or increase community participation have been observed in diverse settings such as megachurches (Wellman Jr et al., 2014), fair trade retail and coffee shops (Brown, 2011) as well as online networks (Maloney, 2013). Based on the literature reviewed in the previous section, neuroscientific research suggests that actions of others are marked and potentially translated into meanings automatically in the motor prefrontal regions through the mirror neuron system. We would expect mirror neuron activation when people are engaging in interaction rituals producing emotional energies. So, one mechanism through which interaction rituals create emotional energy and promote solidarity might be by creating simultaneous shared representations of rituals in the brains of different group members and hence creating a magnifying effect on feelings of participation and inclusion. While the motor areas of the frontal lobes provide the infrastructure for connecting self and the others through motor mimicry, the regions in the prefrontal cortex are suggested to be underlying more abstract evaluations of others and empathy (Uddin et al., 2007). The prefrontal cortex (PFC) hosts two important areas related to the more higher-order operational mechanisms that guide behavior including emotion and decision making. The PFC lies anterior to the motor and premotor areas (Afifi and Bergman, 2005). The prefrontal cortex, which is highly developed in primates, especially in humans, is the largest part of the frontal lobes and phylogenetically one of the latest developing areas (Jerison, 1994; Fuster, 2001). The PFC includes the higher order heteromodal association cortex employed in abstract reasoning, judgment, and social behavior (Blumenfeld, 2002; Waxman, 2010). The PFC has bidirectional connections with various other cortical (such as association cortices of other lobes, and the limbic lobe) and subcortical (including hypothalamus, thalamus, amygdala, and hippocampal formation) areas (Fuster, 2001; Blumenfeld, 2002; Afifi and Bergman, 2005). Many valuable insights about the functions of the prefrontal cortex have been gained by studying the patients with damage to the prefrontal cortex. Among the most famous and the earliest documented of these is the case of Phineas Gage—a railroad construction worker in New England whose forehead was penetrated by a thick iron bar. After damage to his prefrontal cortex, Phineas Gage experienced immense personality and behavioral changes (Damasio et al., 1994). While the extent and the precise location as well as the exact nature of the personality and behavioral changes in the case of Phineas Gage cannot be know with certainty (Macmillan, 2000), this case has become a symbolic marker in the study of neuroscience, pointing to the importance of the prefrontal cortex in abstract functioning including emotional and executive processes. More recent case studies of lesion patients with damage to the PFC also demonstrate the significance of this area in decision-making, social behavior, and emotion (Damasio et al., 1990; Bechara et al., 1996, 2000; Anderson et al., 2000, 2006). For example, patients that had damage to their prefrontal cortex early in their lives, such as in infancy, have abnormal development of social and moral behavior independent of their social environment (Anderson et al., 1999). They disregard social and moral standards, do not express guilt or remorse, and show consistent irresponsibility. In this paper, I suggest a hierarchical division of labor between two primary prefrontal cortex regions: (a) the ventromedial prefrontal cortex (vmPFC) (involved in emotional regulation and motivation) and (b) the dorsolateral prefrontal cortex (dlPFC) (responsible for top-down inhibition and executive functions). This functional division, I suggest, also has implications for sociological research, with vmPFC corresponding to empathy, Theory of Mind, and intuitive moral judgments and dlPFC regulating top-down control of these empathy and inter-group processes that I describe in more detail in the section Sociological Implications of the More Abstract Functions of the Prefrontal Cortices: Emotional Regulation and Self-reflexivity. Below, I illustrate the role of the PFC in motivation and emotion and executive function by providing empirical evidence. The ventromedial regions of the prefrontal cortex, including the orbital PFC, are considered to be important centers for motivation and emotional regulation (Damasio, 1994; Anderson et al., 2006). These regions are medially placed in the frontal region of the prefrontal cortex and are reciprocally connected to sensory cortices and limbic structures (Damasio, 1996; Price, 1999; Berridge and Kringelbach, 2008). While many studies have linked the ventromedial PFC (vmPFC) to emotional regulation (see Adolphs, 2009 for a review), the lower-most orbital frontal parts of the ventromedial PFC region have a more specialized role in reward conditioning, pleasure and happiness (Kringelbach and Berridge, 2009). The orbital PFC activation is correlated with the subjective ratings of the pleasantness of odors (no activation by the unpleasant odors; Rolls et al., 2003), subjective ratings of the pleasantness of water in a thirst experiment (De Araujo et al., 2003), increasing consonance of music (which covaried with subjective pleasantness; Blood and Zatorre, 2001), and perceived attractiveness of faces (O'Doherty et al., 2003). Among the most emblematic modern examples illustrating the importance of the ventral and orbital PFC in emotional regulation is the case of patient EVR who had tumor bilaterally growing in the orbital and ventral PFC at the age of 35 (Eslinger and Damasio, 1985; Damasio, 1994). After the removal of the tumor with surgery, EVR experienced severe changes in his personal and social life including losing his job, going bankrupt and getting divorced twice, despite his intellectual abilities remaining intact (Eslinger and Damasio, 1985; Saver and Damasio, 1991). Group studies of patients with damage to the same areas also found that these patients had blunt affect, deterioration in goal-directed behavior, seemed to get easily frustrated, showed inappropriate social behavior, and were unable to apprehend that these changes were occurring (Barrash et al., 2000). Other studies with adults with vmPFC damage also found that these patients failed to show autonomic responses to socially meaningful stimuli (Damasio et al., 1990), and failed to avoid disadvantageous choices (Bechara et al., 2000). Damasio et al. (1990) argue that these behavioral abruptions caused by orbital and ventral PFC damage in adult life lead to the behavioral syndrome that they term “acquired sociopathy” due to its close resemblance to the sociopathic disorder (American Psychiatric Association, DSM-III, 1980, currently referred to as antisocial personality disorder in American Psychiatric Association, DSM 5, 2013) caused by genetic and/or environmental factors earlier in life. Cases of early-onset vmPFC damage (during early childhood) demonstrate even more severe social conduct problems such that these patients show a lack of concern and responsibility, criminal tendencies, and seem to be devoid of moral emotions such as remorse or guilt and are unaware of these problems while most other intellectual and cognitive abilities are intact (Anderson et al., 1999, 2000). The severity of the early-onset vmPFC patients' behavioral impairments are thought to be related to their impaired acquisition of social and moral knowledge during development (Anderson et al., 2000). These results provide support to a prominent theory about the role of emotions in decision-making: the Somatic Marker Hypothesis (Damasio, 1994, 1996). In this theory, the vmPFC is suggested to function as a convergence zone that holds dispositional linkages between factual information about given situations and somato-sensory states (including emotions) through a combination of prior experience and future anticipation (Damasio, 1994, 1996; Damasio and Everitt, 1996). Accordingly, individuals rely on bodily responses (somatic markers) to differentiate among possible options available while making decisions. Our bodies generate responses (preferable vs. not) through a combination of prior experience and future anticipation. If initial positive experience with a stimulus leads to a pleasurable somatic state, our bodies record this state by generating somatic markers. Thus, in a future situation, with the possibility of the engagement with same stimulus, through activation of these somatic markers (even when the positive outcome is absent) our bodies would bias our preferences toward that stimulus (over another). These markers express themselves in emotions and influence our value-relevant decisions; and thus instead of logically deducing appropriate decisions, Damasio suggests that our body “tells” us which options “feels” the most appropriate (Damasio, 1994, 1996). Executive functions usually refer to cognitive functions that enable individuals to solve difficult, novel and complex tasks by selecting and integrating actions or thoughts with internal goals and mediating actions across time (MacDonald et al., 2000; Fuster, 2001; Miller and Cohen, 2001). These functions include inhibition, switching, working memory, selective attention, problem solving and organizational skills (Alvarez and Emory, 2006). Various studies indicate that the prefrontal cortex has a critical role in executive function. Patients with frontal lobe lesions perform worse than normal subjects or subjects with damage to other brain areas (see Stuss and Benson, 1984 for a review) in the most commonly employed executive function tests (Alvarez and Emory, 2006) like the Wisconsin Card Sorting Test, Phonemic Verbal Fluency, and Stroop Color Word Interference Test. While non-frontal as well as different parts of the frontal lobes also contribute to the executive functions (Alvarez and Emory, 2006), these functions are often attributed to the dorsolateral region of the prefrontal cortex (MacDonald et al., 2000). The dorsolateral PFC is not only linked to the occipital, temporal and parietal cortices and receives visual, somatosensory, and auditory information from them but is also closely connected with the motor areas of the brain and is therefore thought to control behavior via these connections (Miller and Cohen, 2001). Involvement in working memory is considered among the important attributes of the dorsolateral PFC (Fuster, 2000; MacDonald et al., 2000). For example, dorsolateral PFC activation is observed when participants asked to hold increasingly longer sequences of items in their memory, when they are prompted to perform multiple tasks (compared to one task at a time; D'esposito et al., 1995; Cohen et al., 1997; Courtney et al., 1998). These findings indicate the importance of the dorsolateral PFC in planning and goal directed behavior since working memory is required in holding goals in mind and achieving it gradually. Patients with dorsolateral PFC lesions are often observed to be indifferent, abulic or apathetic and show inability to plan ahead, unable to generate hypotheses, have trouble in tasks demanding flexibly shifting sets or changing tasks, have poor verbal fluency, and poor organizational and constructional strategies in learning new tasks (Milner, 1963; Benton, 1968; Jones-Gotman and Milner, 1977; Stuss and Benson, 1984; Waxman, 2010). Alongside general executive function studies, some studies also show that dorsolateral PFC has a role in a cognitive control mechanism related to racial bias inhibition (Stanley et al., 2008). Beyond a precursory mirroring mechanism to empathy, the functional organization of the prefrontal cortex into the emotional and control centers for social behavior offer direct connections with sociological knowledge in three ways: (a) that human moral cognition and empathy is a universal capacity (so several social group biases including racial bias are neither hard-wired nor immalleable), (b) despite this universal, automatic empathic capacity, human empathy is still selective, favoring certain groups over others due to the highly socially susceptible nature of the brain, which restructures activation patterns in response to social pressures, and (c) through reflexive thinking and conscious overwriting, it is possible to top-down control selective empathy and group biases. Below I explain these connections in more detail. The neuroscience literature on empathy—“reading” or understanding others' intentions, thoughts and emotions—has revealed that this capacity is a human universal underlined by activation in the medial and orbitofrontal prefrontal cortices (alongside temporo-parietal regions of the brain; Frith and Frith, 2001; Saxe et al., 2004; Hynes et al., 2006; Singer, 2006; Shamay-Tsoory et al., 2010; Schurz et al., 2014). Also referred to as the “theory of mind” (ToM), humans' ability to attribute intentions and motivations to others' behaviors, thoughts and desires emerge as young as 4 years old and is severely impaired in children with autism (Frith and Frith, 1999; Gallagher and Frith, 2003; also see Hopcroft, 2013 for a sociological treatise). Traditionally measured through a “false-belief task” that presents a child with a story about an actor who leaves an object in a room (e.g., a piece of chocolate left on the table) and exits the room, after which the location of the object is changed by someone else (e.g., chocolate is put in the drawer) and asks where the returning actor would search for their object (on the table—actor's perspective, or in the drawer—the child's perspective; Wimmer and Perner, 1983). While the age in which this capacity was developed was challenged by some studies adapting a deceptive hiding task in favor of a younger age (age of 3 vs. 4) for ToM development (Chandler et al., 1989; Hala et al., 1991; Hala and Russell, 2001), a meta-analytical study of previous research has confirmed the age of 4 as a critical development stage across cultures for ToM development (Wellman et al., 2001). However, further research has demonstrated that individual variability, especially along language abilities (such as syntax, vocabulary, or semantics) is a strong predictor of ToM differences in children (Milligan et al., 2007). Another study even suggested that language may have a causal role in ToM development as older deaf Nicaraguan adults who have had little language exposure (and have incomplete language knowledge), due to the somewhat recent emergence of the Nicaraguan Sign Language, consistently failed ToM tasks, while younger deaf Nicaraguan adults who have had exposure to the language since childhood did not (Pyers and Senghas, 2009). These studies suggest that while developmental stages are critical in ToM and empathy development, social interaction and context also are crucial. Moreover, while the capacity for empathy is shared by all humans, neuroscientific research reveals that human empathy is socially selective, favoring certain groups over others (Cikara and Fiske, 2011; Cikara et al., 2011), making this cognitive phenomenon especially relevant for sociology and the study of group processes. The frontal lobe areas involved in self-referential processing and empathy, particularly orbital and medial prefrontal cortices have been shown to respond more to in-group members and friends (Volz et al., 2009; Freeman et al., 2010; Krienen et al., 2010) and showed reduced activity in response to dehumanized and stigmatized others (Harris and Fiske, 2006). These findings fit well with the sociological understanding that symbolic racial boundaries are shaped by cultural resources available to individuals including historical national and religious traditions, education systems and media, and the structural conditions they are placed in such as market positions, social networks, level of criminality in the communities etc. (Lamont, 1992, 2000). Through our involvement in a wide range of groups (such as recreational groups, ethnic groups, and professional groups), we constantly produce and re-establish competing boundaries (Lamont, 1992). The literature on our selective empathic capacity also aligns well with the current neuroscientific perspectives on inter-group evaluations and bias, which have predominantly been studied with respect to racial attitudes. Racial attitudes and stereotypes have been an important topic for social neurosciences for the last two decades. While majority of early studies have focused on the subcortical structures that are related to basic “fight or flight” responses like the amygdala (e.g., Hart et al., 2000; Phelps et al., 2000; Cunningham et al., 2004; Lieberman et al., 2005; Ronquillo et al., 2007), more recent research has also clearly demonstrated the importance of the frontal lobes for dehumanization and bias inhibition processes involved in prejudice Dehumanization is a cognitive bias that involves the act or psychological process of reducing a human to a non-human being by devoid of mentalizing (or empathizing; Fiske, 2009; see Haslam, 2006 for a review). Often targeting extremely stigmatized out-group members, dehumanization is related to feelings of basic disgust in contrast to feelings of social and moral emotions (Harris and Fiske, 2007; Fiske, 2009). Taking a social neuroscience approach, dehumanization research reports reduced activation in the frontal lobes related to empathy and moral emotions (i.e., medial prefrontal cortex) when dehumanization happens (Harris and Fiske, 2006, 2007; Firat, 2013; Firat et al., 2017). Again, it is important to note that the frontal lobes are not the only brain regions involved in moral judgments or empathy. For example, in a ground breaking study, Young et al. (2010) show that when neural activity in right temporoparietal junction is disrupted with transcranial magnetic stimulation, subjects failed to evaluate harmful intentions of others. Yet, these automatic processes of selective empathy or inter-group bias can be inhibited and overwritten with deliberate thinking through dlPFC activation, the key center for executive functions including temporal-sequencing, planning, working memory and control. Akin to the capacity for reflexivity (the mind's ability to reflect upon itself) lying at the heart of symbolic social interaction theory (Blumer, 1969), the dorsolateral prefrontal cortex, I suggest, provides flexibility (adaptability to changing stimuli) and cognitive control (inhibiting impulses and regulating coherent, consistent behavior) in continuous interactions. As the highest-order, least proximate functioning mechanism of the frontal lobes, the dorsolateral prefrontal cortices produce reflexive input and regulation for the progress and adaptation of human moral actions. For example, Knutson et al. (2007) showed that dorsolateral PFC is activated when subjects are prompted to categorize stimuli in a way that counter their implicit attitudes regarding race or gender. Similarly, Richeson et al. (2003) found increased dorsolateral PFC activation in individuals who scored higher on measures of racial bias when they are exposed to racial out-group faces, which they interpret as individuals with higher racial bias showing more effort and executive control to reduce their bias (see also Kubota et al. (2012) and Ito and Bartholow (2009) for reviews of neuroscience of racial attitudes and functions of the dlPFC). The top-down inhibitory role of the dlPFC, especially in racial bias, potentially challenges many mainstream social psychological views that often rely on the implicit yet often deep-seated assumption that the automatic categorization of persons into racial categories is hard-wired or unavoidable (e.g., Fiske, 2002; Dovidio et al., 2010, also evident in many influential social psychological theories like Expectation States Theory and Social Identity Theory, Tafjel and Turner, 1986; Berger and Webster, 2006; Correll and Ridgeway, 2006). Rooted in an understanding of the evolved cognitive capacity for categorical thinking, in this view, humans categorize everything (objects, animals etc.) into groups or natural types based on perceived similarities (Rothbart and Taylor, 1992; Hirschfeld, 1996; GilWhite et al., 2001) because of its adaptive nature for group survival. However, an alternative view from evolutionary anthropology is that races are not natural types and have not divided tribal societies (Kurzban et al., 2001). Racial categorization and encoding is the byproduct of an essentially moral capacity of coalition building; and, race has become a perceptual cue for detecting alliances under historical conditions that created racially un-egalitarian societies (Kurzban et al., 2001; Cosmides et al., 2003). Coalitional alliance differences along racial lines are further perpetuated in modern societies magnifying health and well-being disparities among others (Boyer et al., 2015; Firat and Boyer, 2015). These arguments also fit well with the sociological racial formation theory, which emphasizes that race is constructed through the historical social, political, and economic forces to sustain stratified social relations and cultural dominance (Omi and Winant, 1994). In sum, observing that the key brain regions involved in processing/regulating socially and morally salient information (such as the vmPFC and the dlPFC) are also involved in racial boundary making would buttress argument that (a) on the one hand, racial bias and categorization are not inevitable (Cosmides et al., 2003; see also Firat et al., 2017), and (b) on the other hand, societal-level ideological and structural changes are required to remove the use of race as a coalitional cue, diminishing racism at the individual-level. A more in-depth understanding of the functions and interconnections of the regions of the frontal lobes lead to several future research questions with significant sociological implications. For example, motor regions of the frontal lobes are involved (in coordination with subcortical structures) in automatic learning, habit, and implicit processes (Sanes, 2003). On the one hand, motor learning and automaticity can be altered through explicit information processing via the dorsolateral prefrontal cortices; while, on the other hand, practice or syncopation related changes can also alter motor behavior only through activation of the motor regions (Sanes, 2003; Ashby et al., 2010). Some interesting questions for social scientists and social psychologists would be: Are there two dissociable mechanisms for altering implicit social information processing (e.g., implicit racial bias, emotional reactions, moral intuitions), one through top-down explicit information and another more implicit via other sensory cues or practice? If yes, are they equally effective in altering implicit evaluations? Could one over the other produce more long-lasting strategies for reducing implicit biases? All of these future research questions and directions have the potential to open particularly fruitful avenues of collaboration between sociologists and neuroscientists that will hopefully contribute to our advancement of the complex social behavior. This theoretical linkage between interaction rituals and the mirror neuron system would also pose several new research questions such as: Do brain correlates of both ritualistic and non-ritualistic interactions recruit mirror neurons? Does the size of the groups in which interaction rituals occur affect mirror neuron network activation, or in other words, would rituals that happen in very large groups (e.g., mass public protests) vs. small groups (e.g., friend circles) be represented the same way in the brain? And, with the increasing online networking technologies, would online interaction rituals be represented the same way as face to face interactions in the brain? For a moral capacity that encompasses also prosociality and altruism, the ventromedial prefrontal cortices (moral emotional processing or tagging centers of the brain) seem to be more crucial than slower cognitive centers. If emotions are primary in moral empathy and social connectedness, would that mean that in order to promote inter-group solidarity, we can target emotional messaging and empathy? How would these processes differ in the so-called collectivistic vs. individualistic cultures? As decades of sociological research shows emotions are physiologically experienced yet culturally constructed processes (Thoits, 1989); they are intrinsically linked to cultural norms (Hochschild, 1983; Hochshild, 1989) as well as power and status hierarchies (Kemper, 1981, 1986, 1991) and therefore are important mechanisms in interpersonal evaluations (Smith-Lovin, 1990; Robinson and Smith-Lovin, 2006), social exchange processes (Lawler et al., 2000; Lawler, 2001) as well as in self and identity processes (Burke, 1991, 2008). How would all these structural and cultural variations shape, alter, challenge emotive processes, and activation differences in the ventromedial prefrontal cortices? Notwithstanding, several research studies point that the vmPFC and the dlPFC, the emotional and cognitive hubs of the prefrontal cortices, are also reciprocally connected, regulating self-control, reward delay and impulse control (e.g., Hare et al., 2014; Steinbeis et al., 2014), with potentially dissociable roles in reward processing and value attributions—with dlPFC being more selective for the variability (i.e., high vs. low) of values (Kahnt et al., 2011). One research study even demonstrated that damage to the dorsolateral but not ventromedial prefrontal cortices diminished monetary contributions in a public goods game (Wills et al., 2018). This body of research might indicate that while a more holistic theory of morality and social cooperation should take into account both emotional and cognitive components of neural coding, more cognitive dlPFC activation perhaps could be involved in comparing various social markers including social status, economic status or even cultural markers of power. In summary, the frontal lobes have a variety of diverse and complicated functions that I divide under three primary conceptual categories with specific implications for social organization and connectedness: a. control of voluntary behavior (mirror neuron and action perception processes), b. emotional and motivational regulation (Theory of Mind and emotional empathy), and c. executive functioning (top-down regulation of selective empathy and racial attitudes). I should note that these functional categories naturally overlap with each other (e.g., influence of emotions on attention) and often are interdependent. Moreover, even though they are mainly attributed to the frontal lobes by previous research, many other cortical and subcortical regions also carry out important roles in these functions (Alvarez and Emory, 2006). I argue that by performing these functions in a hierarchical manner, the frontal lobes provide a specially organized infrastructure for human social connectedness that range from the most proximate and basic capacity for intention reading and mirroring to more complex emotional humanization/dehumanization and abstract top-down regulation of inter-group processes. To conclude, this paper attempts to outline the implications of the frontal lobe functions for both the micro-individual and the macro-society. Our biology is fundamentally social, meaning that “it is our nature to nurture and to be nurtured” (Wexler, 2006, p. 13). Among the animal species, the human brain has the longest period in which its growth is shaped by the environment; however, the human brain is not only shaped by the environment, it also shapes the social environment (Wexler, 2006). The frontal lobes enable humans (as one of the species with the largest frontal lobes) to engage in complex, goal-directed behaviors consistent, and continuous across time, yet also flexible and responsive to the stimuli and changes both external and internal to the individual. Many of the frontal lobe functions underlie sophisticated behaviors that are core for complex social organization and life, such as social and symbolic interaction, moral cognition and behavior as well as empathy and inter-group attitudes. The frontal lobes, therefore, help sustain us not only as individuals but also as social systems and societies. However, this is not to propose that the frontal lobes or the brain are independent causal agents in human social functioning (a biologically reductionist view often attributed to neurosciences). My point is rather to explain the inner-mechanisms of a complex, social organism that can help us better understand how environmental factors (both evolutionarily and developmentally) shape our biology, which in turn affects social behavior. This dynamic reciprocal interaction is among the hallmark of our social life, and is thus of crucial importance to sociology. An earlier version of this paper was presented at the Annual Meeting of the American Sociological Association, Montreal, Canada. August 2017. Sections of this paper were developed as part of the author's dissertation thesis University of Iowa (Firat, 2013). Afifi, A. K., and Bergman, R. A. (2005). Functional Neuroanatomy: Text and Atlas, 2nd Edn. New York, NY: McGraw-Hill. American Psychiatric Association (1980). Diagnostic and Statistical Manual of Mental Disorders, 3rd Edn. Washington, DC: American Psychiatric Association. Berger, J., and Webster, M. Jr. (2006). “Expectations, status, and behavior,” in Contemporary Social Psychological Theories, eds P. J. Burke (Stanford, CA: Stanford University Press), 268–300. Blumenfeld, H. (2002). Neuroanatomy Through Clinical Cases. Sunderland: Sinauer Associates. Blumer, H. (1969). Symbolic Interactionism. Englewood Cliffs: Prentice-Hall. Colby, C. L., and Olson, C. R. (2003). “Spatial Cognition,” in Fundamental Neuroscience, 2nd Edn, eds L. R. Squire, F. E. Bloom, S. K. McConnell, J. L. Roberts, N. C. Spitzer, and M. J. Zigmond (San Diego, CA: Academic Press), 1229–1247. Collins, R. (1987). “Interaction ritual chains, power and property: The micro-macro connection as an empirically based theoretical problem,” in The Micro-Macro Link, eds J. Alexander, B. Giesen, R. Munch, and N. Smelser (Berkeley, CA: University of California Press), 193–206. Collins, R. (2014). Interaction Ritual Chains, Vol. 62. Princeton, NJ: Princeton University Press. Collins, R., and Hanneman, R. (1998). “Modelling the interaction ritual theory of solidarity,” in The Problem of Solidarity: Theories and Models, eds P. Doreian and T. J. Fararo (New York, NY: Routledge), 213–237. Damasio, A. R. (1994). Descartes' Error: Emotion, Reason, and the Human Brain. New York, NY: Grosset/Putnam. Damasio, A. R., and Everitt, B. J. (1996). the somatic marker hypothesis and the possible functions of the prefrontal cortex [and Discussion]. Philos. Trans. R. Soc. Lond. B. Biol. Sci. 351, 1413–1420. Durkheim, E (1912/1995). The Elementary Forms of the Religious life. New York, NY: Free Press. Firat, R. B. (2013). Apathetic Racism Theory: A Neurosociological Study of How Moral Emotions Perpetuate Inequality. Dissertation thesis, Iowa City, IA: University of Iowa. Franks, D. D. (2010). Neurosociology: The Nexus Between Neuroscience and Social Psychology. New York, NY: Springer Science and Business Media. Gallese, V. (2001). The ‘shared manifold' hypothesis. From mirror neurons to empathy. J. Conscious. Stud. 8, 33–50. Goffman, E. (1959). The Presentation of Self in Everyday Life. Garden City: Anchor. Harris, L. T., and Fiske, S. T. (2006). Dehumanizing the lowest of the low: Neuroimaging responses to extreme out-groups. Psychol. Sci. 17, 847–853. Hirschfeld, L. A. (1996). Race in the Making: Cognition, Culture, and the Child's Construction of Human Kinds. Cambridge: The MIT Press. Hochshild, A. (1989). The Second Shift: Working Parents and the Revolution at Home. New York, NY: Viking. Kemper, T. D. (1986). How many emotions are there? Wedding the social and autonomic competences. Am. J. Sociol. 94, 263–289. Lamont, M. (2000). The Dignity of Working Men: Morality and the Boundaries of Race. Class and Immigration. Cambridge, MA: Harvard University Press. Mead, G. H. (1934). Mind, Self and Society From the Standpoint of a Social Behaviorist. Chicago: University of Chicago Press. Omi, M., and Winant, H. A. (1994). Racial Formation in the United States: From the 1960s to the 1990s. New York, NY: Routledge. Porter, R., and Lemon, R. (1993). Corticospinal Function and Voluntary Movement. Oxford: Oxford University Press. Robinson, D. T., and Smith-Lovin, L. (2006). “Affect Control Theory,” in Contemporary Social Psychological Theories, ed P. Burke (Stanford, CA: Stanford University Press), 137–164. Rothbart, M., and Taylor, M. (1992). “Category labels and social reality: Do we view social categories as natural kinds?.” in Language, Interaction and Social Cognition, eds G. R. Semin K. Fiedler (Thousand Oaks, CA: Sage Publications), 11–36. Smith-Lovin, L. (1990). “Emotion as the confirmation and disconfirmation of identity: an affect control model,” in Research Agendas in the Sociology of Emotions, ed T Kemper (Albany, NY: State University of New York Press), 238–270. Tafjel, H., and Turner, J. C. (1986). “The social identity theory of intergroup behavior,” in Psychology of Intergroup Relations, eds W. G. Austin and S. Worchel (Chicago, IL: Nelson-Hall), 7–24. TenHouten, W. D. (1973). Science and its Mirror Image: A Theory of Inquiry. New York, NY: Harper and Row. Waxman, S. G. (2010). Clinical Neuroanatomy, 26th Edn. New York, NY: McGraw-Hill Medical. Copyright © 2019 Firat. This is an open-access article distributed under the terms of the Creative Commons Attribution License (CC BY). The use, distribution or reproduction in other forums is permitted, provided the original author(s) and the copyright owner(s) are credited and that the original publication in this journal is cited, in accordance with accepted academic practice. No use, distribution or reproduction is permitted which does not comply with these terms.